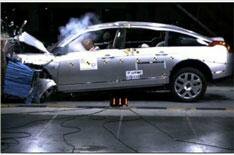 Euro NCAP changes crash ratings | What Car? Safety group Euro NCAP is planning to launch a new crash-test-rating system next year. The new overall rating will continue to have scores out of five stars, however greater emphasis will now be placed on pedestrian protection in the overall rating. Euro NCAP says 67% of the cars it tested last year were awarded just two stars for pedestrian protection. It is concerned that many manufacturers set out to achieve high scores for adult occupant protection to attract car buyers, but compromise safety investment in other areas. Also, for the first time, the new rating will consider advanced driver assistance technologies such as electronic stability control, while the assessment of adult occupant protection will be expanded to include whiplash testing. Under the new rating scheme, there will no longer be stars produced for the three ratings adult protection, child protection and pedestrian protection and there will be a different logo for the overall star rating. The former rating will remain for cars that have been tested already under the old system and the two ratings will be clearly separated. Manufacturers would only be able to use the appropriate logo for the new rating in their marketing. Results for the first cars tested under this new system will be released in February 2009.